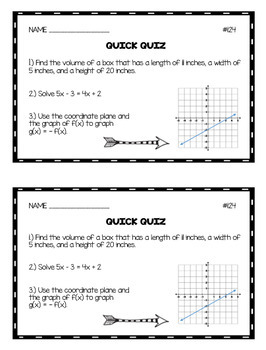 Quick quizzes are a great way to start the day and to get students thinking about math before diving into a new lesson. The spiral design of the quick quizzes requires students to remember and use previously learned skills so that past learning and material is not forgotten! I use the time students are completing this activity to take attendance and complete other small tasks before we start the lesson. 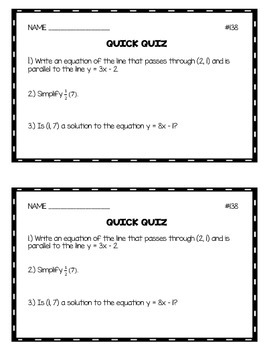 This set of quick quizzes includes 50 three-question quick quizzes for Algebra 1. This is the third set of 4 that I will be creating for Algebra 1. Purchase Algebra 1 Quick Quizzes Bundle: Volume 1-4 to get all four volumes at once at a significant savings!! I have also make this available in my store as Algebra 1 Do Nows: Volume 3 and Algebra 1 Bell Ringers: Volume 3 to meet the formatting needs of other teachers (the quick quiz, bell ringer, and do now problems are the same problems just different titles). Each version comes with an answer key. 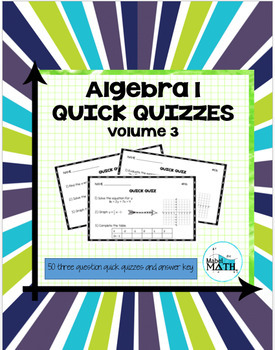 If you like my Algebra 1 Quick Quizzes: Volume 3, be sure to follow my store by clicking on the ‘Follow Me’ to receive notifications of new products as they become available. Copyright © Linsey Abel. All rights reserved by author. This product is to be used by the original downloader only. Copying for more than one teacher, classroom, department, school, or school system is prohibited. This product may not be distributed or displayed digitally for public view. Failure to comply is a copyright infringement and a violation of the Digital Millennium Copyright Act (DMCA). Clipart and elements found in this PDF are copyrighted and cannot be extracted and used outside of this file without permission or license. Intended for classroom and personal use ONLY.